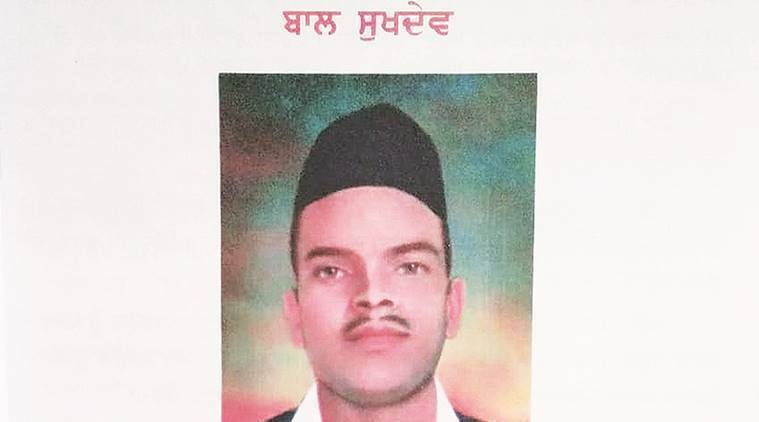 In a major goof-up by the Punjab School of Education Board (PSEB), a photograph of martyr Rajguru has been identified as that of martyr Sukhdev in a chapter on the latter in class-IV Punjabi book for session 2019-20. The PSEB chairman, Manohar Kant Kalohia, meanwhile, insists that photo is that of Sukhdev but “an enquiry has been marked to get the photo verified”. The board is in process of distributing free textbooks in government schools. Some teachers who went through the book Tuesday detected the goof up in the book’s chapter-3 titled ‘Balak Sukhdev’. Sukhdev Thapar who was from Ludhiana district of Punjab and Rajguru, who was from Maharashtra, were hanged to death along with Bhagat Singh by the British. Speaking to The Indian Express, Chaman Lal, an eminent researcher on Bhagat Singh, Rajguru and Sukhdev said that it was shameful for the Punjab Education department that till date our academicians cannot recognize and differentiate between two martyrs who laid their lives for the country’s independence. “The photo printed in the book is that of Rajguru not Sukhdev. It is a shame on education department that decades after their martyrdom, our so called academicians and subject experts cannot differentiate between Rajguru and Sukhdev’s photographs. It is actually very sad,” said Chamn Lal who is also advisor, Bhagat Singh Archives and Resource Centre, Delhi. PSEB chairman Manohar Kant Kalohia, speaking to The Indian Express, cited experts to claim that the photo used in the book is that of Sukhdev and not of Rajguru. “I have questioned the experts who approved the content and they are still saying that we have used the right photograph. The same photo was used by government of Punjab in several commemorative programmes and it is even available on Google,” said Kalohia. Asked if he has confirmed from other experts, and not Google, he said, “I have asked vice-chairman of the board to verify further and enquire if this is the right photograph. If not, we will rectify the error”.